The BT-LH1710W is suitable for broadcast and professional applications. 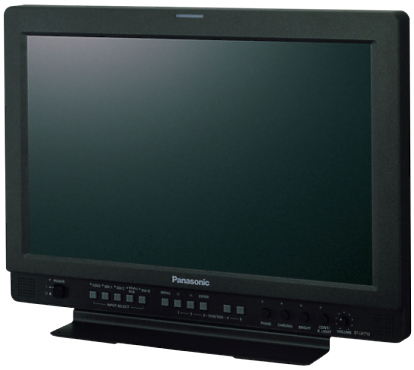 The monitor compensates for RGB accuracy in 256 discrete steps. The rated gamma properties (g = 2.2) are reproduced and the gradation suitable for broadcasting is achieved. Color temperature is selectable from 3 preset values, 9300K, 6500K and 5600K as well as totally custom settings ranging from 3000K to 9300K. A special circuit compensating for noise caused from diagonal lines has been developed for the BT-LH1710W. This processing reduces the occurrences of jagged noise in the diagonal direction, not just vertically in the field, by detecting correlations and making optimal interpolations. The BT-LH1710W uses a technology to produce the same EBU-based colors as CRT monitors. Colors on CRTs appear different from those in LCD monitors due to slight differences in the monitor's chromatic range. Color-Space Conversion compensates for these differences. Here's a custom feature: BT-LH1710W will display the input signal as a waveform image. The waveform monitor screen can be picture-in-picture on top the video image and the overlay picture can be placed in any of the screen's four corners. A frame of video can easily be frozen and displayed as a still image on the left side of the screen. This function can be utilized to match a live camera with a frame of video shot at an earlier time or with a different camera. There are two display modes: FULL for displaying and comparing the entire image on the screen, and PART for displaying and comparing only the center part of the images.